Hotel Europa is a prestigious luxury hotel situated in the heart of Shkodra offering its guests the atmosphere of a grand hotel with every modern amenity. The 50 spacious elegant rooms, are cosy and at the same time refined. 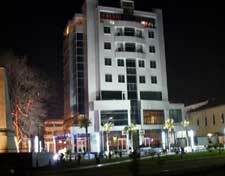 Hotel Grand Europa, offers the most exclusive accommodation in Shkodra. All rooms and suites are equipped with modern amenities designed to welcome business and leisure travelers in style. 50 rooms (4 splendid suites, 20 matrimonial rooms and 26 twin beds). Room amenities include Mini bar, Hairdryer, Satellite TV, Key card, Air conditioning, Direct Dial Telephones, Hydro Massage. The prestigious "Europa" restaurant, housed in a splendid room, offers excellent International and traditional albanian cuisine. Elegant surroundings and high class services add further value to the refined cuisine. The hotel also has elegant conference rooms, equipped with the most modern technical equipments.